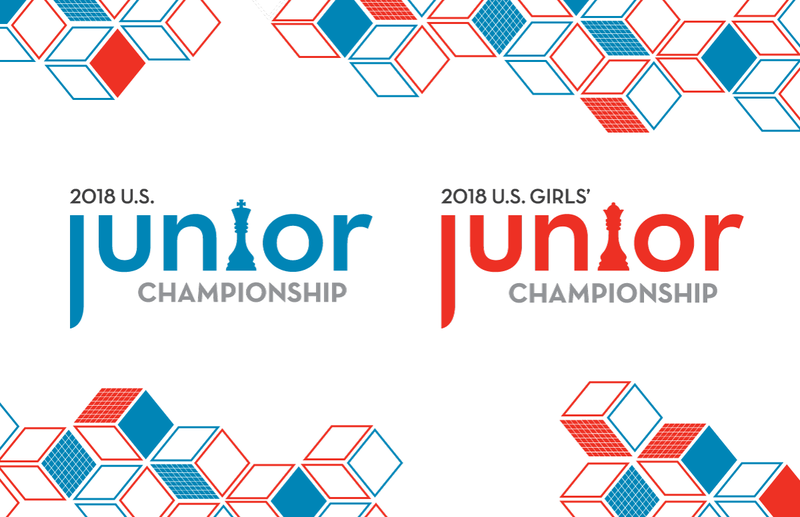 For the first time, we have a clear leader in the Girls’ section while Advait Patel has extended his lead in the Juniors section by defeating his closest rival. 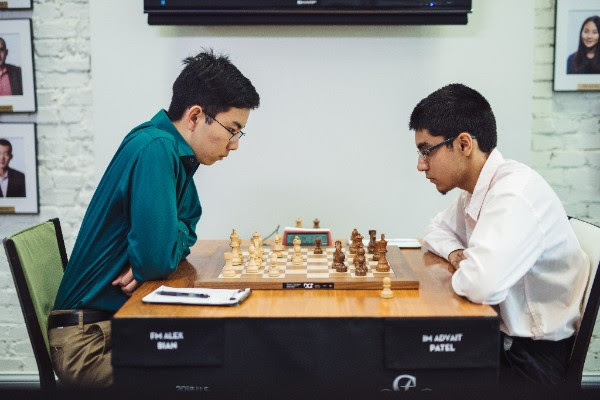 The game of the day was the battle between the leader, Advait Patel, and Alex Bian, who trailed by just half a point when the day began. With the pawn break 20...d5, Patel built up considerable pressure in the center. After a couple inaccurate moves by Bian, Patel cracked through on the kingside, and Bian’s position collapsed. Akshat Chandra continued his comeback by defeating a second fellow grandmaster in a row. 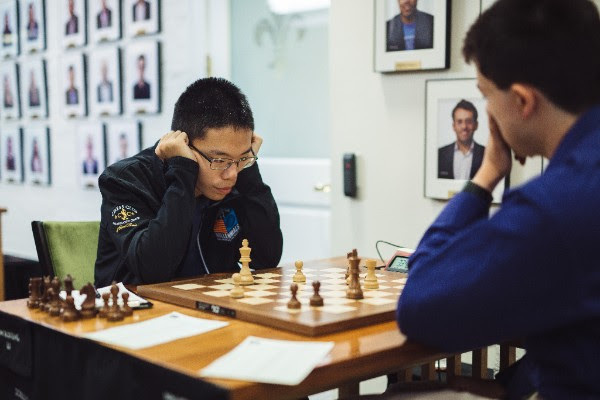 After a tactical inaccuracy by Andrew Tang, Chandra gained two pieces for a rook and then an extra pawn. The resulting position was a matter of technique, and he won cleanly. Chandra now joins the tie for 2nd. Defending Champion Awonder Liang won his first game of the tournament today against Wild Card Annie Wang. Liang obtained an advanced passed d-pawn when Wang decided to trade her bishop for his octopus knight on d6. Eventually, the pressure created by the passer and Liang’s active pieces overcame Wang’s position. Praveen Balakrishnan began as an interesting Scotch game but liquidated to an endgame by move 21. Though the players tried to make progress for a while, they eventually agreed to a draw in a level rook ending. Ruifeng Li vs. Mika Brattain reached a closed but fascinating middlegame with knights of both sides fighting for strong outposts on c4, d5, d6, and even b7. Though Li had an advantage when he gained extra kingside space by pushing his f-pawn to f5, Brattain defended well. After many exchanges, the two agreed to a draw. 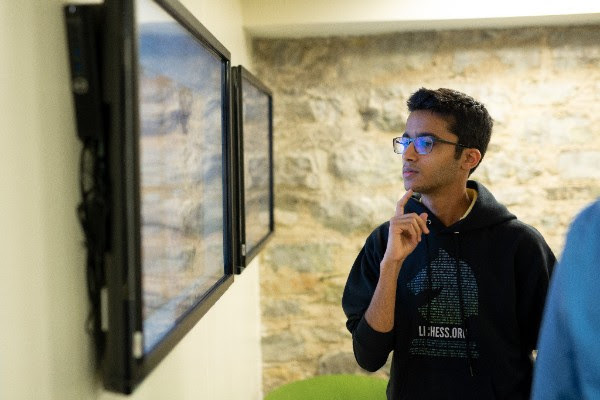 As we near the halfway mark, Advait Patel now leads the Junior section by a full point. He also has great chances of maintaining his lead as he has the white pieces against a lower rated player tomorrow. The Girls’ section was a massacre for the black pieces. Players on the white side obtained 4.5 out of 5 points today. 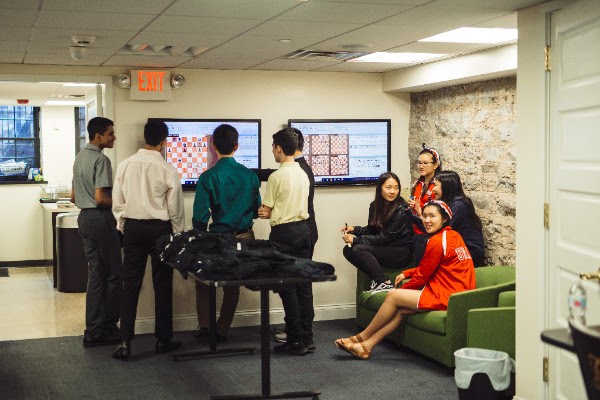 Tournament leaders Carissa Yip and Emily Nguyen faced their closest rivals, Thalia Cervantes and Jennifer Yu, who trailed by half a point heading into the round. Yip found a nice tactical opportunity against Cervantes, using a discovered attack and then a double attack to end up two pawns ahead. Cervantes resigned just eight moves later. 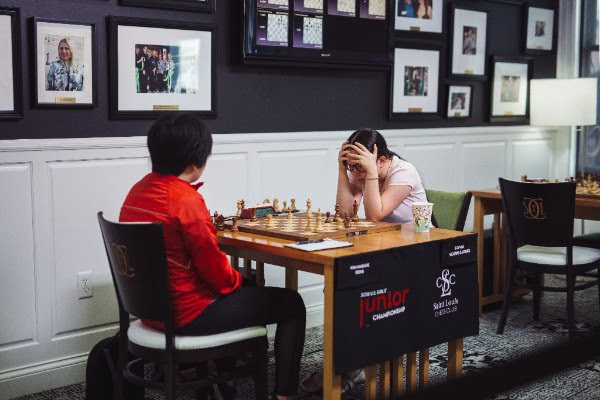 Jennifer Yu and Emily Nguyen had an interesting bishop pair vs. knight pair middlegame struggle. The bishops gained the upper hand as the position opened up, and Yu won two pawns, which she converted without too much trouble. This victory brings Yu to clear 2nd, trailing Yip by only half a point. 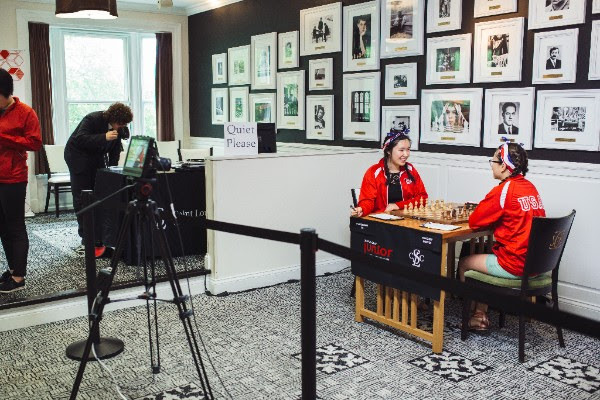 Maggie Feng vs. Sophie Morris-Suzuki featured a bishop vs. knight imbalance where Feng had an outside passed a-pawn, and Morris-Suzuki had a kingside majority. This classic struggle was disrupted when Morris-Suzuki tried a hyper-aggressive but inaccurate knight sacrifice to open up Feng’s king. Feng defended precisely and won with her extra material. 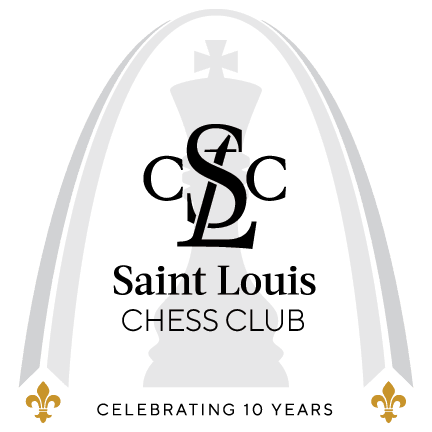 Martha Samadashvili scored her first win today against Nastassja Matus with the Maroczy Bind against the Sicilian Defense. Play was fairly equal until Nastassja blundered with 24...Ra2? ?, allowing Samadashvili to win a piece with a backrank tactic. The one peaceful result was Rochelle Wu vs. Sanjana Vittal. Wu gained the bishop pair and expanded in the center, but Vittal’s kingside pressure won her a pawn. Vittal had an advantage when the players agreed to a draw. Don’t miss round 5. Tomorrow is the last round before the rest day, so the players are likely to go all-out for the win!